Image: my friend Mae taken by Bryan. The days are lazy, warm, and end in light rain and cool breezes. Mornings are full of cool breezes filling curtains and tea on the porch. I hear some say this is too warm and I hear some say they cannot wait for Fall, but I beg to differ. The weather is perfection and every reason I love it here. The sun fills my soul as I weed the garden and it honestly feels good to really sweat. This whole week I have been dreaming of the first leap of the Summer in to Lake Michigan. You know the thrill of diving head first in to cool crisp water and your whole body has been warm from the sun and all of a sudden is chilled in one moment by the bright blue water? For a long time I was pretty fearful of jumping off the boat in to the water, but this moment a couple Summer’s ago changed me. I had never done it and I am so thankful for friends who tell you to jump even when you scared. We all say one, two, three and without hesitation plunge over our heads in infinitely deep water. Since that moment I have craved that feeling and it becomes an aching desire the moment it turns 80 degrees outside. The 4th of July is next week and to me that marks the true life of Summer. It is the moment when all of a sudden there is this unexplained freedom and desire to live in the moment and to wake with the sun and end the day with the last sun beams gleaming through the woods as you make a bon fire with friends. I cannot think of anything greater than Summer in Northern Michigan. I pray I never take it for granted or ever know it’s absence. This season always teaches me great things and maybe that is why I crave to dive head first off the boat again, maybe it is to feel that freedom and to feel fully present in a moment in no way you possibly can otherwise. That first dive in to the clear blue lake is all I dream about right now. I decided I should more often share these very personal things I am dreaming of. I like the thought of encouraging you all and myself to dream more and be vocal about it. 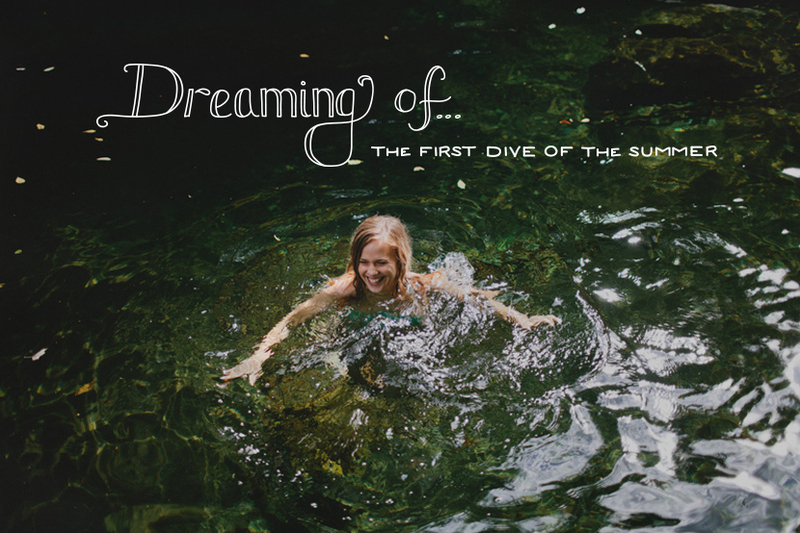 We all have desires and wishes whether they are the first dive in to the lake or taking that trip of a lifetime. The first part of making something a reality is to acknowledge it. So what have you all been dreaming about? If you could accomplish anything in this moment what would it be? Nothing is silly. I hope you all have a splendid and beautiful weekend. I plan to soak in as much sun and outdoors as I can. All I want is to sit on the porch and read a book and eat cantaloupe while I watch the grass grow. Funny how Summer just begs you to enjoy the days more than you do in any other season. This weekend I am also purging my closet in a huge way! I am going to be documenting it and hope to share how we plan to minimize our own closets down to what we need and wear the most. I am pretty excited about this!! So stay tuned. Cheers my friends! Listen to this as you dream big, k? Such a beautiful picture. We’re having such a bad summer here in London, I’m dying for one of those hot, sweaty summer days. Here’s hoping…enjoy your weekend. I love this. Oh, I am so jealous of your summer! My big dream right now is honestly to pack up and move north. It’s a few years off, I suspect, but I need mountains and seasons and cool-breeze-y summers. Florida is just not my place. I’m currently dreaming of doing a bakery school after I’ve done my bachelor (in journalism wich i’m doing now) and my master. But if I do all those things my life is planned for the comming 6 years, so I just keep dreaming about it and don’t know if I’m going to do it yet. Because I don’t like to have my path all planned out. I really like the more personal post on your blog! Love it! I love how magical and amazing summer is. It’s wonderful and beautiful and everything smells sweet. Summer nights are exciting and anything can happen. Best part of summer is always the first dive. So memorable!! These are beautiful words. Although I am adoring a sunny winter in the Southern Hemisphere, long summer days cannot come soon enough. I cannot wait to hear about your process to purge your closets. We have been trying to go “minimal” and more nature friendly in all our material possessions and the closet has been the hardest part. You guys are such a great inspiration!